Tooth Brushing - The Right Way! Proper tooth brushing plays an important role in the prevention of tooth decay and gum disease. To maintain good oral hygiene, you need to brush your teeth twice a day. It is important to use the right toothbrush and technique to make sure you clean your teeth well. Equipment: ?Throw away your old toothbrush after three months or when the bristles start to flare, whichever comes first. 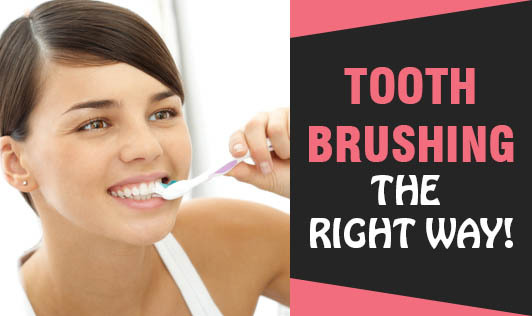 If your bristles flare up much sooner than every three months, you may be brushing too hard. Try easing up. Use a soft-bristled toothbrush that allows you to reach all areas of your mouth. The use of harder brushes causes great risk of harming your gums. Technique:?You should hold your toothbrush at a 45-degree angle while you brush. Place your toothbrush at the gum line, and clean the outer portion of two to three teeth at a time with a back and forth and rolling motion. Use the same technique to clean the inner surfaces of your teeth. Use the tip of your toothbrush to clean behind your front teeth with an up-and-down motion. To finish, gently scrub the chewing surfaces of your teeth, and brush your tongue from back to front to remove bacteria. Importance:?Plaque is a sticky substance that develops on and around teeth within 20 minutes after you eat. Plaque releases enamel-eroding acids, which can cause tooth decay. If plaque is not removed, it hardens to form tartar, which also leads to decay. When plaque irritates the gums, gum disease and tooth loss can result. Proper tooth brushing and flossing is the best way to remove plaque and prevent tooth decay. Proper tooth brushing is important for your oral and overall health. Ask your dentist about other products that may contribute to oral health. Now say "cheese" with a better smile!